Millennials are coming of age in politics, none more so than Alexandria Ocasio-Cortez, one of the youngest women to ever win a seat in Congress. 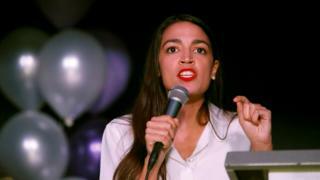 At just 29, her victory in New York's 14th congressional district is part of a trend of young voters shaping politics in their image and in distinct millennial style. First-time mid-term voters form about 16% of the electorate, and many did not shy away from making their political activity loud and clear online. However, Democrat losses in Florida, Texas and Georgia suggest the historically left-leaning youth vote couldn't tip key races. On Tuesday, Instagram filled with stories of young people gramming their 'I Voted' stickers, students went on voting marches, and school shootings survivors manned a "war room", phoning potential voters. While official youth turnout won't be known for several days, there was an 188% increase from 2014 in early voting by 18 to 29-year-olds, according to ABC's exit polls. Many used social media to celebrate the historically diverse candidates who have taken seats across the country, and look ahead to the 2020 presidential election. Taylor Swift, newly-vocal about the elections, posted an Insta story marathon to her 122 million followers congratulating tens of voters, scribbling "thank you" in neon fonts. "Omgggg so I voted for the first time ever today!!! I'm feeling so empowered!!! Some of my peers teased me for being "too involved" in politics but it was all worth it!! I voted for myself as well as yours. I have hope for humanity," wrote 18-year-old activist Kenidra Woods on Twitter. March for Our Lives, the gun control movement set up by survivors of the mass shooting in Parkland, Florida, shared pictures of 15-year-old students calling up voters. While some of these engaged voters were always going to turn out, young people feel they have a reason to go to the polls. The mid-terms come at a time when Gen Z's (people aged 15 to 21) high stress levels are contributing to the worst mental health crisis of any generation, according to a recent report by the American Psychological Association. Gun violence, political turmoil and migrant family separation are among issues causing concern, with 75% of Gen Z describing mass shootings as a significant source of stress. In Texas, more than 500 college students marched to the polls to protest against allegations of voter suppression, according to the Houston Chronicle. "Big events in American politics cause young people to think about politics differently," the author of a Harvard poll, which suggested Gen Z turnout could be historically high, told the Atlantic in October. Issues popular with millennials also did well on the night, particularly in state-wide ballots, suggesting that their vote may have had an impact. Michigan voters approved the legalisation of cannabis, a move supported by 74% of the age group nationally, according to Pew Research Centre. In Washington, initiative I-1639 passed, making firearm laws the strictest in the country, according to the Seattle Times. It was a landmark night for LBGT candidates too, with America's first openly gay governor, Jared Polis, elected in Colorado. However, in tight races in Texas, Florida and Georgia, where young voters were projected to be fired up by media, including USA Today, Republican candidates did well, deflating Democrat hopes. The under-35s are usually considered liberal, so the success of conservative candidates suggests that the youth vote didn't make as many waves as predicted. But with commentators like CNN's Van Jones talking about a "rainbow wave" of young, female, LGBT, and black and brown candidates sweeping the country, the way both parties look and express themselves to voters is changing.